Close your nostrils and mouth tightly and look at a watch. What did you feel after some time? How long were you able to keep both of them closed? Note down the time for which you could hold your breath. So, now you know that you cannot survive for long without breathing. The number of times a person breathes in a minute is termed as the breathing rate. During breathing inhalation and exhalation take place alternately. A breath means one inhalation plus one exhalation. Would you like to find out your breathing rate? Do you want to know whether it is constant or it changes according to the requirement of oxygen by the body? Let us find out by doing the following activity. Generally we are not aware that we are breathing. However, if you try you can count your rate of breathing. Breathe in and out normally. Find out how many times you breathe in and breathe out in a minute? Did you inhale the same number of times as you exhaled? Now count your breathing rate (number of breaths/minute) after brisk walk and after running. Record your breathing rate as soon as you finish and also aftercomplete rest. Tabulate your findings and compare your breathing rates under different conditions with those of your classmates. From the above activity, you must have realised that whenever a person needs extra energy, he/she breathes faster. As a result more oxygen is supplied to our cells. It speeds up the breakdown of food and more energy is released. Does this explain why do we feel hungry after a physical activity? When you feel drowsy, does your breathing rate slow down? Does your body receive sufficient oxygen? Let us now learn about the mechanism of breathing. Normally we take in air through our nostrils. When we inhale air, it passes through our nostrils into the nasal cavity. From the nasal cavity, the air reaches our lungs through the windpipe. Lungs are present in the chest cavity . This cavity is surrounded by ribs on the sides. A large, muscular sheet called diaphragm forms the floor of the chest cavity.Breathing involves the movement of the diaphragm and the rib cage. During inhalation, ribs move up and outwards and diaphragm moves down. This movement increases space in our chest cavity and air rushes into the lungs. The lungs get filled with air. 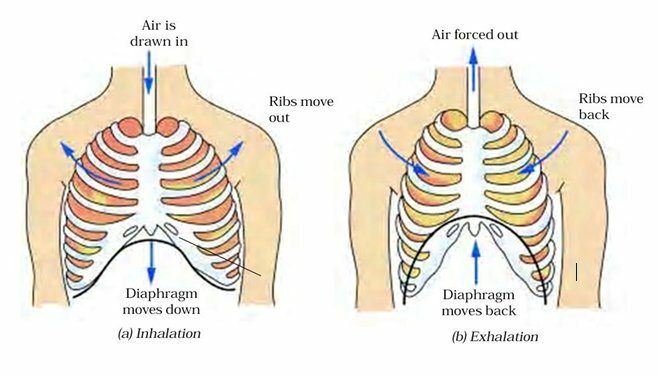 During exhalation, ribs move down and inwards, while diaphragm moves up to its former position. This reduces the size of the chest cavity and air is pushed outof the lungs. These movements in our body can be felt easily. Take a deep breath. Keep your palm on the abdomen, feel the movement of abdomen. Smoking damages lungs. Smoking is also linked to cancer. It must be avoided. The air around us has various types of unwanted particles, such as smoke, dust, pollens, etc. When we inhale, the particles get trapped in the hair present in our nasal cavity. However, sometimes these particles may get past the hair in the nasal cavity. Then they irritate the lining of the cavity, as a result of which we sneeze. Sneezing expels these foreign particles from the inhaled air and a dustfree, clean air enters our body. Take a deep breath. Measure the size of the chest with a measuring tape and record your observations in Table. 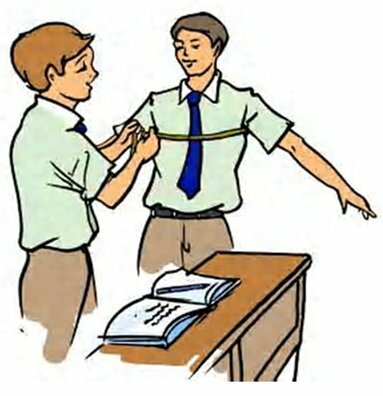 Measure the size of the chest again when expanded and indicate which classmate shows the maximum expansion of the chest. We can understand the mechanism of breathing by a simple model. Animals such as elephants, lions, cows, goats, frogs, lizards, snakes, birds, have lungs in their chest cavities like the human beings. Cockroach: A cockroach has small openings on the sides of its body. Other insects also have similar openings.These openings are called spiracles. Insects have a network of air tubes called tracheae for gas exchange. Oxygen rich air rushes through spiracles into the tracheal tubes, diffuses into the body tissue, and reaches every cell of the body. Similarly, carbon dioxide from the cells goes into the tracheal tubes and moves out through spiracles. These air tubes or tracheae are found only in insects and not in any other group of animals. Earthworm: Earthworms breathe through their skins. The skin of an earthworm feels moist and slimy on touching. Gases can easily pass through them. Though frogs have a pair of lungs like human beings, they can also breathe through their skin, which is moist and slippery. Can we breathe and survive in water? There are many organisms which live in water. How do they breathe under water? You have studied in Class VI that gills in fish help them to use oxygen dissolved in water. Gills are projections of the skin. You may wonder how gills help in breathing. Gills are well supplied with blood vessels for exchange of gases. Like other living organisms, plants also respire for their survival. They also take in oxygen from the air and give out carbondioxide. In the cells oxygen is used to break down glucose into carbon dioxide and water as in other organisms. In plants each part can independently take in oxygen from the air and give out carbon dioxide.The leaves of the plants have tiny pores called stomata fo exchange of oxygen and carbon dioxide. Breathing is a part of the process of respiration during which an organism takes in the oxygen-rich air and gives out air rich in carbondioxide. The respiratory organs for the exchange of gases vary in different organisms. During inhalation, our lungs expand and then come back to the original state as the air moves out during exhalation. In animals like cow, buffalo, dog and cat the respiratory organs and the process of breathing are similar to those in humans. In earthworm, the exchange of gases occurs through the moist skin. 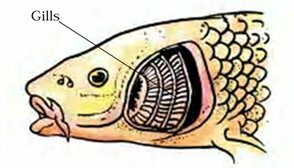 In fishes it takes place through gills and in insects through the tracheae. 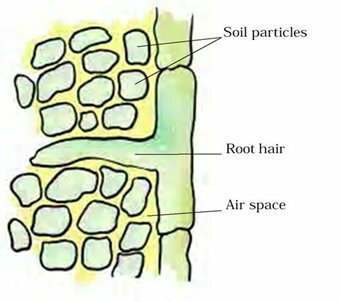 In a plant the roots take in air present in the soil. Leaves have tiny pores called stomata through which they exchange gases.The breakdown of glucose in the plant cells is similar to that in other living beings.